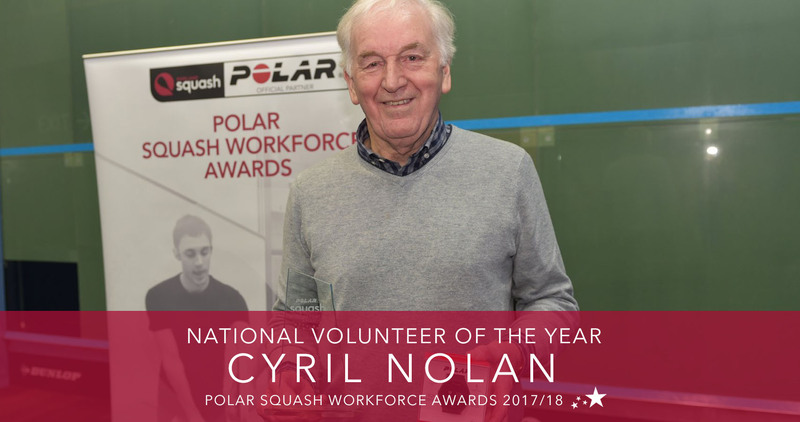 80-year-old Cyril Nolan from Shrewsbury has been named national volunteer of the year by England Squash for his continuous dedication and service to the sport. The awards panel heard how Cyril tirelessly continues to volunteer at Shrewsbury Squash and Racketball Club, raising funds for the club’s expansion and boosting membership figures. His relentless determination to improve facilities at Shrewsbury Squash and Racketball Club led to Cyril helping to raise over £120,000 for the construction of a third court and he is now assisting with an attempt to raise £40,000 towards the cost of a new fitness suite. With the help of Cyril and other volunteers, his club now sees over 200 members participating on the courts after numbers dropped to as low as 32 back in 2012. “I was happy to be in the top three and I was even more surprised when I found out that I had won." A self-proclaimed late starter, Cyril has been playing squash for over 37 years and used to spend his lunchtime out on the court at his nearby squash club rather than eating meals. Originally from Llandudno before moving to Shropshire 43 years ago, Cyril constantly strives towards the promotion of squash, sitting on his club’s committee, organising coaching bookings as well as running an internal league. Cyril also finds the time to organise a weekly coaching session for juniors every Saturday morning, as well as playing regularly, attending fitness classes and captaining his side in the Shropshire league. “Cyril is an inspiration to everyone at the club.